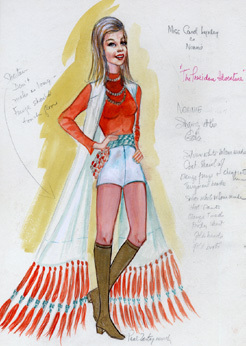 The Paul Zastupnevich costume design drawings span the years 1960-1979 and encompass 2.7 linear feet. The collection consists primarily of nearly 40 signed costume sketches for "Beyond the Poseidon Adventure" (1979), "Five Weeks in a Balloon" (1962), "The Lost World" (1960), "The Poseidon Adventure" (1972), "The Swarm" (1978), "The Towering Inferno" (1974), "Viva Knievel!" (1977), "Voyage to the Bottom of the Sea" (1961), and "When Time Ran Out" (1980). In addition, there are several production sketches from "Five Weeks in a Balloon." Other than a production file for the "Voyage to the Bottom of the Sea" pilot, there is no material on his television career, nor is there any information about his personal life. Paul Zastupnevich (1921-1997) was born in Homestead, Pennsylvania, where he graduated from Homestead High School. He attended Carnegie Tech, Duquesne University, the University of Pittsburgh, and the Louise Salinger School of Dress Design in Pittsburgh. In the mid-1940s Zastupnevich relocated to Hollywood and was associated with many productions at the Pasadena Playhouse over the next ten years. "The Big Circus" (1959) was Zastupnevich's first film credit. As a costume designer his career was most closely associated with producer-director-writer Irwin Allen. Allen's "The Big Circus" and "Beyond the Poseidon Adventure" (1979) were bookends to Zastupnevich's career. His other Allen-related credits include "Five Weeks in a Balloon" (1962), "The Lost World" (1960), "The Poseidon Adventure" (1972), "The Swarm" (1978), "The Towering Inferno" (1974), "Voyage to the Bottom of the Sea" (1961), and "When Time Ran Out" (1980). He also worked on a number of Allen's television shows, including "Land of the Giants," "Lost in Space," "Time Tunnel," and "Voyage to the Bottom of the Sea." Zastupnevich received Academy Award nominations for costume design for "The Poseidon Adventure," "The Swarm," and "When Time Ran Out."